As soon as your teenager begins to drive, notify your insurance agent that there will be an additional driver in the house. Since teenagers are inexperienced drivers, they tend to get into a lot of accidents. This will, unfortunately, be reflected in higher insurance rates. If you have a daughter, you can expect your insurance to go up as much as 50%. A son will increase your car insurance by as much as 100%. Consider also raising liability limits or buying an umbrella liability policy for additional protection. Insure your son or daughter on your own policy. Let your insurer know if your teenager is going away to school. If your son or daughter lives away at school � at least 100 miles from home � you will get a discount for the time they are not around to drive the car. This, of course, assumes that they leave the car at home! Encourage them to get good grades and to take a driver training course. Most companies will give discounts for getting at least a "B" average and taking recognized driving courses. Insurance companies differ dramatically in how they price policies for young drivers. The type of car your teen will be driving will dramatically affect the price of insurance. They should drive a car that is easy to drive and would offer protection in the event of a crash. You should avoid small cars and those with high performance images that might encourage speed and recklessness. Trucks and SUVs should also be avoided, since they are more prone to rollovers. Talk to them about safe driving. 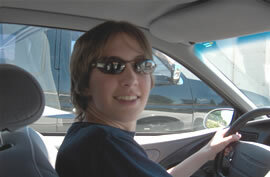 Driving safely will not only keep your son or daughter alive and healthy, it will also save money. As your teenager ages, insurance rates will drop -- providing that they have a good driving record. Talk to them about the dangers of combining driving with alcohol, lack of sleep and distractions. Accidents occur each year because a teen driver was using a cell phone, playing the radio or talking to friends in the backseat. Also, teens should be careful when they are passengers in their friends' cars. Institute your own version of a graduated drivers licensing program. A number of states have reduced teen accidents by restricting the amount of time new drivers may be on the road without supervision. If your state doesn't have such a program, you may institute this same policy with your own children. Also, take an active role in helping your teenager learn to drive. Plan a series of practice drives in a wide variety of situations �- nighttime, rain and snow. You also want to give them time to work up to challenges such as driving in heavy traffic, expansive bridges or on freeways.